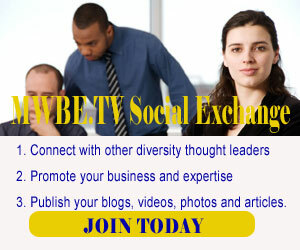 Welcome to Charles DuPree & Associates DBA MWBE.TV Social Exchange! These terms and conditions outline the rules and regulations for the use of Charles DuPree & Associates DBA MWBE.TV Social Exchange’s Website. By accessing this website we assume you accept these terms and conditions in full. Do not continue to use Charles DuPree & Associates DBA MWBE.TV Social Exchange’s website if you do not accept all of the terms and conditions stated on this page. The following terminology applies to these Terms and Conditions, Privacy Statement and Disclaimer Notice and any or all Agreements: “Client”, “You” and “Your” refers to you, the person accessing this website and accepting the Company’s terms and conditions. “The Company”, “Ourselves”, “We”, “Our” and “Us”, refers to our Company. “Party”, “Parties”, or “Us”, refers to both the Client and ourselves, or either the Client or ourselves. All terms refer to the offer, acceptance and consideration of payment necessary to undertake the process of our assistance to the Client in the most appropriate manner, whether by formal meetings of a fixed duration, or any other means, for the express purpose of meeting the Client’s needs in respect of provision of the Company’s stated services/products, in accordance with and subject to, prevailing law of United States. Any use of the above terminology or other words in the singular, plural, capitalisation and/or he/she or they, are taken as interchangeable and therefore as referring to same. Unless otherwise stated, Charles DuPree & Associates DBA MWBE.TV Social Exchange and/or it’s licensors / members own the intellectual property rights for all material on Charles DuPree & Associates DBA MWBE.TV Social Exchange All intellectual property rights are reserved. You may view and/or print pages from https://exchange.mwbe.tv for your own personal use subject to restrictions set in these terms and conditions. Redistribute content from Charles DuPree & Associates DBA MWBE.TV Social Exchange (unless content is specifically made for redistribution). Certain parts of this website offer the opportunity for users to post and exchange opinions, information, material and data (‘Comments’) in areas of the website. Charles DuPree & Associates DBA MWBE.TV Social Exchange does not screen, edit, publish or review Comments prior to their appearance on the website and Comments do not reflect the views or opinions of Charles DuPree & Associates DBA MWBE.TV Social Exchange, its agents or affiliates. Comments reflect the view and opinion of the person who posts such view or opinion. To the extent permitted by applicable laws Charles DuPree & Associates DBA MWBE.TV Social Exchange shall not be responsible or liable for the Comments or for any loss cost, liability, damages or expenses caused and or suffered as a result of any use of and/or posting of and/or appearance of the Comments on this website. Charles DuPree & Associates DBA MWBE.TV Social Exchange reserves the right to monitor all Comments and to remove any Comments which it considers in its absolute discretion to be inappropriate, offensive or otherwise in breach of these Terms and Conditions. You hereby grant to Charles DuPree & Associates DBA MWBE.TV Social Exchange a non-exclusive royalty-free license to use, reproduce, edit and authorize others to use, reproduce and edit any of your Comments in any and all forms, formats or media. We will approve link requests from these organizations if we determine that: (a) the link would not reflect unfavorably on us or our accredited businesses (for example, trade associations or other organizations representing inherently suspect types of business, such as work-at-home opportunities, shall not be allowed to link); (b)the organization does not have an unsatisfactory record with us; (c) the benefit to us from the visibility associated with the hyperlink outweighs the absence of Charles DuPree & Associates DBA MWBE.TV Social Exchange; and (d) where the link is in the context of general resource information or is otherwise consistent with editorial content in a newsletter or similar product furthering the mission of the organization. If you are among the organizations listed in paragraph 2 above and are interested in linking to our website, you must notify us by sending an e-mail to info@mwbe.tv. Please include your name, your organization name, contact information (such as a phone number and/or e-mail address) as well as the URL of your site, a list of any URLs from which you intend to link to our Web site, and a list of the URL(s) on our site to which you would like to link. Allow 2-3 weeks for a response. WHATEVER CAUSE. YOU AGREE THAT YOU USE THE SITE AND THE CONTENT AT YOUR OWN RISK. NEITHER WE NOR OUR SERVICE PROVIDER WARRANT THAT THE SITE WILL OPERATE ERRORFREE OR THAT THIS SITE, ITS SERVER, OR THE CONTENT ARE FREE OF COMPUTER VIRUSES OR SIMILAR CONTAMINATION OR DESTRUCTIVE FEATURES. IF YOUR USE OF THE SITE OR THE CONTENT RESULTS IN THE NEED FOR SERVICING OR REPLACING EQUIPMENT OR DATA, WE SHALL NOT BE RESPONSIBLE FOR THOSE COSTS. THE SITE AND CONTENT ARE PROVIDED ON AN “AS IS” AND “AS AVAILABLE” BASIS WITHOUT ANY WARRANTIES OF ANY KIND. WE AND OUR SERVICE PROVIDER HEREBY DISCLAIM ALL WARRANTIES, INCLUDING, BUT NOT LIMITED TO, THE WARRANTY OF TITLE, MERCHANTABILITY, NONINFRINGEMENT OF THIRD PARTIES’ RIGHTS, AND FITNESS FOR PARTICULAR PURPOSE. A. The company (Charles DuPree & Associates MWBE.TV Social Exchange may change any of the terms or conditions of this Agreement with at least 30 days’ written notice to Advertisers. After receiving written notice of a rate change or change in any term or condition, the Client may terminate this Agreement, as of the effective date of the change, by giving notice in writing to the company. In the event that the Client does not terminate the existing Agreement, the existing Agreement will remain in effect, and any content placed after the effective date of the change will be subject to the terms, conditions, and rates modified. B. This Agreement is subject to all provisions of the MWBE.TV rate chart in effect on the date this Agreement is signed. C. Clients or agencies with a record of delinquent payment of accounts with the Charles DuPree & Associates. will be required to pre-pay 6 months service until good credit is reestablished. D. Payment is due in full upon receipt of the current period. Service may be interrupted or cancelled on any account which has an overdue balance more than 15 days of due date. If delinquent accounts are referred for collection, the client agrees to pay reasonable fees for such collection, including but not limited to attorney’s fees. This Terms and conditions page was created at Charles Dupree & Associates. If you have any queries regarding any of our terms, please contact us.